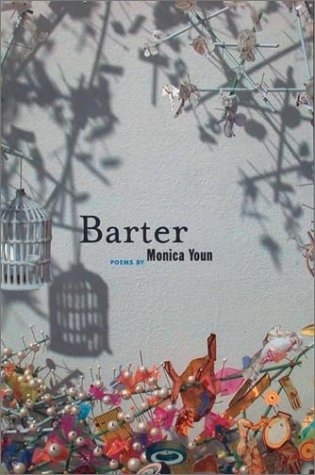 The poems in Barter, Monica Youn’s exciting first collection, negotiate the unstable spaces of spareness and excess, myth and history, the thing and the thing seen, evidence of a truth and the truth itself. Rendered with a dazzling array of structures and allusions, these poems describe—and become—a strange gallery of paintings and portraits. She offers a Polaroid left on a windshield, directions for “Drawing for Absolute Beginners,” the lenses of stereoscopes, “The Scream” stolen from the museum walls. Both an homage to and a warning against nonexistent things, Barter introduces a vibrant new voice and a new way of seeing. Monica Youn’s “covetous eye” apprehends the world—the possible and improbable—for what it is: an optical illusion.